The Christ in Prophecy Journal: Are You Standing for Righteousness? There are three things that each of us need to do in order to stand for righteousness. When we seek to do God's will in our lives, we can get a dagger in the heart in more way's than one; especially when it involves members of our own beloved household. Mine has been twisted again today. Praise The Lord anyway! i know i`ve been here before but dose anyone besides me ever wonder: whats the point? regardless of what one does people are going to feel up their girlfriends, go to their partys, smoke their weed and continue to reject God. it seems the world is so evil that no matter how much you pray or what you say or do people just love their sin. non-christians and sadly alot of christians and it seems ministry is pointless. anyone else ever been there? Because what you say is largely true; then all the more reason for us to seek to do as The Lord says in our own lives. Given the hurt and grief He must feel by mankinds rejection of him, and believe me that is a dreadful pain, and the sloppy ways of too many Christians; it's up to us to do His will in our own lives just to show that we love Him, and aren't afraid to own Him openly in this present darkness. Presently that is the nearest thing we can do to giving Him a hug. Hug from me to you. hartdawg, remember Elijah? After his battle with the prophets of Baal, what did he do? He gave up. He felt hopelessness and despair. So, what you're feeling isn't new. I feel it all the time. It's kind of like we're in our own Battle of the Bulge. The Army was protecting the town of Bastone in Belgium. At one point, the US 101st Airborne Easy Company had only one bullet per soldier! They didn't have proper cold-weather gear: Some only had light jackets. They had no food: the Army Air Corps couldn't make supply drops due to fog. This went on for weeks in the frigid terrain of the Ardennes mountains. What's my point? They never gave up. They held off wave after wave of German offensives and protected Bastone. They held their ground until Patton could show up with his tanks and artillery. And to this day, no one in the 101st Airborne's Easy Company admits they needed rescued. Never forget, hartdawg, you are in the LORD's army. Many Christians don't like to think that we are in a war, but we are. And we need to think like soldiers. We're going to get bogged down and probably out-gunned, but we are to fight the good fight. Defend what we can defend. Cry out the battlecry "Maranatha!" and go to war! He has a battleplan and He knows what He's doing. Just follow orders, soldier. We DO win!!! You said basically what I was going to post, that is, why bother? It seems that the world is on the brink of tribulation, we'll be checking out, so why? Would anything we do make a difference anyway? I hate to say these things but I have to be honest. I've given up for the most part and WANT this world we've (that includes me) made to come to an end and let the reign of Jesus begin. When my motivation is "Please God, we've messed it up, we are failures, please send Your Son back to reign forever" then who can blame me? It may look like we're losing, but I read the back of the Book: We win! It sounds like you're giving up. Retreating. The bible mentions the Breatplate of Righteousness, but there is no mention of protection for the back! We have to advance and hold on! Dig in! Hold your ground. Those who stand firm to the end are truly saved. If the salt of the earth loses it's saltiness, how can be made salty again? Look up, for your redemtion is coming closer. You can't look up if you're head's hanging down. We don't give up because people - loved ones, friends, neighbors - are going to Hell. They are going to be separated from God. They are going to exist in anguish and despair. They are never going to know God's love. They are going to a second death. We hold the light of the world, the message of hope, the key to their rescue. We are like rescue teams showing up in a devastated land. We are like caregivers who show great love to the sick and needy. We are messengers of the All Mighty God (a great privilege). Never give up! Never surrender! Too much is at stake. it`s not that i`m saying what`s the point, but that i often think what`s the point? at times (many times it seems) i get fed up investing sometimes years of my life into people and seemingly no fruit whatsoever and praying with no results. the tricky thing about Satans lies is there is sometimes alot of truth to them. not everything that comes from him is a lie. thats what makes him all the more deceptive. know what i mean? one reason i look forward to the 2nd coming is as dr reagan said on a program a long time ago is to see satan get whats coming to hin. Every lie has a sprinkling of truth, hartdawg. It's like where I'm working now. It's a factory that's kinda hit or miss when it comes to having work. All last year management said, "We're working on getting new product in." We could say that they're working on getting a new product-line or we could say that the new product is coming in pre-packaged because the factory is now a distribution center. Either way, new product is coming in. Is it a lie? Yes. But it does have some truth. Dr. Reagan said "...after the Lord has identified your issue and told you what to do, then follow that popular slogan that says, "Just do it!" Can someone please explain to me how this happens? How does this realization exactly occurs that I'm supposed to go out and do "x" because God said so. I've never understood this. I understand good vs. evil. I understand how God wants me to live. I understand when I sin. I understand what Jesus is all about. But I can't grasp how does someone know God says do a specific action like go sit in a door of an aborition clinic? God will make it clear to you, or at least somewhat clear. thru the word, what you`re reading may have little to do with abortion or whatever it is but he`ll still speak, or maybe thru a friend or simply by listening to the Holy Spirit. whatever the case if you`re in tune with the Spirit, ull know. if it aint clear thats when you step out in faith. I hear that a lot, too, people saying "God told me to do this or that." What they're really saying is that "I feel like I should do that." A friend even justified marrying the wrong girl and then divorcing her a few months later because of feelings. He was so confused that God "led" him to do these things, when it really wasn't God at all. The Bible could have corroborated what God's desires are. Another misinterpretation is that we should wait to some well-defined instructions fall out of the sky and proclaim to us exactly what to do. In the meanwhile, we just sit tight and do nothing. That isn't how it works. God nudges us in the right direction by placing a special need on our hearts, and we follow through by "just doing it!" -taking the first step - in any direction. If it's for the Lord, don't worry, He will bless it. If you're off course some, He will correct it. So, yes, if you are burdened by abortion or the lost or edification, do something - anything - but sit and wait. The guidence only comes when we do. Once I figured after much trial and heartache that's how God operates, living in His will has been made life so much simpler. Thank you for that answer Nathan. The "God nudges us..." paragraph brought understanding. Nathan's earlier post starting "We don't give up because people - loved ones, friends, neighbors - are going to Hell." still didn't move me past my "I've given up" attitude. But this afternoon I had to do an inspection and while returning to the office I passed a cemetary abutting the road - seeing those grave markers - knowing dead people were there whose fates were sealed - Nathan's words popped into my head and the reality of mortality slammed me over the head. How did I dare say what I did? We have to hang in there and continue the work. I regret my earlier post. as i said, it seems to be a reoccuring issue for me. when i see friends i care about on their way to hell, or if christians ruining their lives, and i prey and do everything i can to stop it it gets discouraging. how many did noah save? just his family. how many repented with jeremiah? only 1 forigner. how about ezekiel? none. only lots family was saved. biblical and secular history is filled with examples of prophets and preachers who had no converts yet were faithful. God wants obedience, not results but it still gets discouraging. i`m sure most of you can relate. my point to you Billy is this, i`m glad God "slammed you on the head" but you shouldnt regret your post. it`s a normal reaction. look at Job and Jremiah. what matters is what you do with what God gives you. its about faithfulness not fruitfulness. will we impact and lead many to christ? maybe, maybe not. we just need to obey. sorry about the long post, its just a continuing struggle for me. thought i was past it then a friend starts weed and other stuff and i realize i aint past it yet so i must be reminded by articles like this its about obedience, not results. i`ll stop now. I agree my reaction was normal as a mortal human but I can still have regrets about it, too. Anyway, thanks for your thoughtful replies. God speaks to us from our "heart" and if allowed, moves into our "mind". Satan, on the otherhand, starts at the "mind" and works overtime to block messages coming from the "heart". You will find strong evidence of this when you speak to "bullies" of school age. They will say, they may have felt sorry(heart message) for the individual they were tormenting, but felt such satisfaction (message in the mind) from what they were doing that they over-rode the feeling of sympathy, and so continued on with what they were doing. Sign me up as someone else who can relate to the "give up" sentiments... 30 years ago I first wrote salvation letters & sent Bibles to all family & friends spread out all over the country. Nothing. Not even a thank you. Kept sending tracts & stuff like that over the years. Then stopped for a long long time. Then in more recent years while educating myself on the current progress of the one world government/religion, etc., I sent emails for five years straight (2003-2008) of news reports, commentaries, etc. of how it ties in to Bible prophecy (hoping the info from a "news angle" might jar some of them out of their sleep). During those 5 years I would get so discouraged at the lack of interest & I would tell myself I was not going to do it any more. Then some time would pass & I would send a few more emails. Several times I would write that they should simply sign up/subscribe for my email newsletter (via the freebie email groups online that I was using)... I did this as a "test" to see if anybody cared enough to do so. Only the ONE niece previously mentioned actually went & signed up ASAP! BLESS HER HEART!!! When my younger sister moved cross country, she later told me a man across the street came over to chat one day shortly after she moved in, when she was out in the driveway & he invited her to the Bible study that his family held in their home (they were Baptists). I knew THAT was an ANSWER to my prayer!! But my sis never went, not once. That was about the killer for me to pray for family. My heart just gave out. Praying is enormously hard work! (especially when you have a BIG family... It's just overwhelming & very tiring!). More recently, last year, my Mom wanted to know WHY I thought that all the siblings were NOT saved!!! I was so flabberghasted I couldn't even talk! (I wanted to scream: "WHAT makes YOU think they ARE????" but I didn't say it, praise God, calm down first, lol). Finally I said, "For one thing, if they WERE saved, they WOULD BE ***TALKING ABOUT IT*** because you can't hold it in when you ARE saved because that's what God ***PUTS IN YOU***!" (to talk about it). She nodded. I guess she thinks because they are all "nice, good people," &/or because we had all been baptized as infants (RCC which nobody has been involved with since grade-school days, the parents neither) that that somehow assures they are all saved. Sigh sigh sigh! The willful chosen life of ignorance lived by, not only my now 80+ aged parents, but siblings & friends, is a constant grief of spirit. Last year when I stayed at my parents house for 2 weeks, I came with DVDs to share. I thought MAYBE they would be willing to "watch" vs "reading." My father fought me from the first suggestion to "let's watch a documentary." He demanded to know, "How can we believe what these people say?" (without seeing one single second of the documentary! Yet he believes everything Rush Limbaugh says!). He also was the one who fought me most vehemently when I first began reading/studying the Bible 30 years ago! He would holler that "men wrote it!!" & it is just "brainwashing"! :-/. My Dad one day during those 2 weeks was boasting that he was NOT a sinner! (aaargh! Again I felt like screaming at the ignorance but I didn't). I quietly (thank you Lord!) said, "I know what you're thinking: you think because you never smoked, don't drink & don't fool around, that that means you are not a sinner. But God sees it differently. He sees that ALL MEN & WOMEN inherited SIN from Adam via their earthly fathers, on down through the generations. So in that way, yes you are a sinner. But that's why Jesus did not have an earthly father but a heavenly one. Hence, he did NOT have the inherited sin from Adam so He was the ONLY human who truly was NEVER a sinner & that's why He could pay for your/our sins..." (etc., something to that effect is what I said). The good news was that he replied, "Well how about that. I never heard it explained that way. It makes sense." (WHEW!! One small point of truth logged into my father's head/heart!!!). Even so -- & this was the 2nd thing -- recently I bought a ton of Bibles & had each person's name engraved on each. You could say this will be my last big effort! I plan to keep it simple & send a Bible & salvation message to each person one more time (since it's been 30 years since I sent Bibles to everyone the first time). If I've never made it plain enough in the past, I will try harder this time, ie: YOU WILL SPEND ETERNITY SOMEWHERE (heaven or hell), so WHERE would YOU like to spend it? :). Now that all of us are so much older in our 50's, there's still hope they are starting to THINK about eternity vs when we were younger 30 years ago. 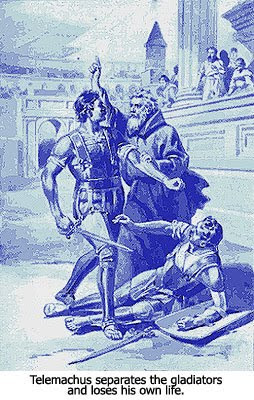 PS: Very touching story re Telemachus, though he paid a heavy price indeed. Yet the amazing outcome -- no more gladiator games/killings EVER? -- wow!!! Sorry, Mitchell, you've lost your crown. I just received your most recent article on Standing for Righteousness. Sir, while I most appreciate your wisdom, I do take issue with the article and I am hoping for your ear. I agree that all too often Christians stay on the sidelines when it comes to "action", however, I did not see one Biblical reference supporting your suggestions to, "Pray that God would burden your heart with an issue, ask for his guidance in how to act, and then, "Just Do It!" Biblical support leans more towards the Great Commission- spreading the Gospel, Truth, and NOT toward enacting social change. If we are doing our job of spreading Truth, hearts and minds will be changed which will, in turn, change behaviors. Not to imply that I am against standing on the street corner at an abortion clinic, sharing Truth with women entering it's ranks. Further, and more specifically, I see no Biblical support to say that we don't have enough time or room to care about or fight all evils. First of all, our greatest example, Christ, was not an outspoken advocate for or against the social ills, barring apostasy, but was greatly concerned that the Word was spread. So, in Him, our greatest fight is in sharing Truth and in resisting deception! Sir, my heart was further grieved when I read your example included, "A Monk Who Challenged An Empire." Telemachus, a monk he was, a noted eastern aesthetic (eastern mystic). You claim he, "lived alone as a hermit seeking God." We have many examples of mystics who lived their lives as hermits "seeking (g)od", but a Christian that does not make. I fear when I see Christian leaders compromising on the Truth's of Scripture to give examples of non-Christian good deeds, especially when Scripture is replete with Godly martyrs. Further, you included a quote by Edward Gibbon. I disagree with the quote, as I believe it really only applies, and greatly so, to our King, but more importantly, Mr. Gibbon converted to Roman Catholicism at an early age (which I would hope you wouldn't argue is a Christian faith) and his book from which you retrieved that quote, The Decline and Fall…, was, for a time banned in several countries because of it's aggressively anti-religion/ anti-Christian content and it's highly anti-Semitic content. Also, he was a noted champion of Enlightenment. I am concerned that you either agree with your post, or you were unaware of the truths of what you posted. We, as you know, are being confronted with a mysticism movement within the ranks of Christianity that I believe has grown to such a terrifying size it surely is the great falling away. True Christians are seeking after teachers of Truth in these dark days, not wanting to be perverted by those lacking discernment. I pray that you will consider my words and look forward to your response. There's no other way to put this...you are WAY OFF BASE! Based on a long time of reading posts here, the majority of us would never be duped by or stand for it if we felt Dr. Reagan was in any way promoting mysticism. As Christians we are indeed called to share the Gospel (Matt. 28:19-20; Acts 1:8), leading hearts and lives to Jesus Christ. But, we are also called by Jesus in Matthew 5:13-18 to be "salt and light" in the world, showing by our loving example what Jesus stands for. As Hebrews 13:16 states, "And do not forget to do good and to share with others, for with such sacrifices God is pleased." And so, it is not just us sharing the Gospel that the Lord wants, though that's primary, but for us to share Jesus' love with everyone (Lk. 10:27) based the example He demonstrated for us while on earth. And, what was Jesus' example while on earth? He healed the sick, fed the poor, showed mercy to the sinner, and gave the world the truth. Are we actively following what Jesus told us to do, or are we in (self)righteous indignation just talking the talk? 1. I never claimed to have the "final say". I shared MY point of view. 2. I don't claim MY point of view is synonymous with the Word of God as you imply. By the way, I stand by MY opinion that you are WAY OFF BASE on Dr. Reagan. Most importantly, I wanted to question Dr. Reagan on his use of the desert monk to illustrate his point. Your response didn't address that concern. As I stated in my previous post, the monk that he references was an eastern mystic. We certainly can agree that an eastern mystic is not a fitting example as one who did something righteous for God. The world is full of non-believers, New Agers, mystics, and Catholics who DO many good deeds, but that is not enough- one must have the true Christ and be grounded in His Word. Without that foundation, one should not be used as en example as someone to emulate. Perhaps Samson- who had a very similar story to the example produced by Reagan? However, Samson was a repentant man of God- according to Scripture, our ONLY proper and fitting source. My biggest question and concern was simply- I have read Dr. Reagan's posts, as well as yours, fondly, for quite some time, and I didn't understand his anti-Biblical selection of a mystic. This concerned me even greater when seen in context of a mystical usurping of Christianity. I drove by a local church just the day before I read his post that was citing a Ghandi quote on their church marquee. Why stray from God's Holy Scripture to illustrate a point you agree is a Scriptural value? Perhaps, mom4truth, the following verses should be stricken from the Bible based on your problem with Dr. Reagan. After all, doesn't this story use the example of a despised Samaritan as the example of one doing the Lord's work in contrast to the priest and the Levite. Shouldn't this story be turned around so the priest is the example and not the Samaritan? Who was doing right in God's eyes in Dr. Reagan's example? The monk or the cheering crowd of a Christian nation. CAN'T WAIT FOR YOUR REPLY! Note the emphasis on "WAS selfish" for being a desert monk. Asceticism was at the time considered to be a very godly pursuit, though. Without the Essenes we wouldn't have the Dead Sea Scrolls. Without Medieval monks making precise copies we'd be lucky to have a Bibles at all today. Monks were the first on the scene to evangelize the New World. Monks have played a very important role in the advancement of the Gospel and shouldn't be summarily discounted. Mom4Truth, if it helps ease your mind, see some of our other articles and shows like on the Emergent Church to see how Dr. Reagan and I feel about the growing apostasy in the Church (a sign we're in the end times, btw). Billy said "CAN'T WAIT FOR YOUR REPLY!" I copy and pasted my reply on the mom4truth website comments of her article implying Dr. Reagan is promoting mysticism. Guess what - she DELETED my comment. Thanks for your reply. Sorry I couldn't get on here before now. I hear what you are saying in regards to desert monks, however, I didn't see evidence for Telemachus' having been included in that category. And, as you are fully aware of the apostate climate in the churches, I'm sure you know that the "Desert Fathers" are hugely credited for the mystical inroads, first in Catholicism, and now in mainline churches and denominations. My concern was that the referenced monk was more along the lines of the mystical Desert Fathers rather than a righteous group of followers of YHWH. To say to me that I should strike certain Scripture was a vindictive, spiteful comment that doesn't deserve attention. I think, Billy, perhaps you should research who the Samaritans were. Despised because they promoted a false gospel? No. Despised because they were mystics, much like the Jewish Kabbalah adherants? No. Despised simply because the Jews didn't view them as a "clean" people because they were half-breeds. The Jews didn't like them simply because they regarded them as dogs- the lowliest of creatures. They were used as an example, not as a separate entity, but as an example that God is not a respector of persons. Would God legitimize a mystic? No. But a group disregarded simply because of their breed? Out we go. What bothers me the most, Billy, in your nefarious attempts to "shut me down" is that you are denying that it is okay, safe, and protected by God's Word that we should ask questions of fellow brethren, and most importantly, those in leadership over us. If someone has a concern or a question for Dr. Reagan, I would assume he would absolutely welcome a person to share and get clarification. It serves to bring unity and clarity and accountability to the leader. God's Word demands accountability from His teachers! The problem that so many fall into is that they refuse to ask those hard questions from their leaders simply because they think their leader is above reproach- and that is exactly how and why SO MANY Christian leaders are falling into the current wave of apostasy. As Nathan pointed out, and I agree with him, I believe today's falling away is the pertinent sign that Jesus is on His way, and the first thing we are warned of is the wolves in sheep's clothing, creeping in unawares. Do you not imagine that comes from people silenced from speaking out or voicing their concerns? Instead of you being grateful that I was being a Berean and simply asking a question from someone I've come to love and trust, you discouraged me and put me down. I would never want to do that to a fellow believer! My mom used to say to us when we were little, "Before opening your mouth to another, make sure you ask yourself- Is it true? Is it kind? Is it necessary?" Perhaps, Billy, that would come in handy for your responses from here forward.